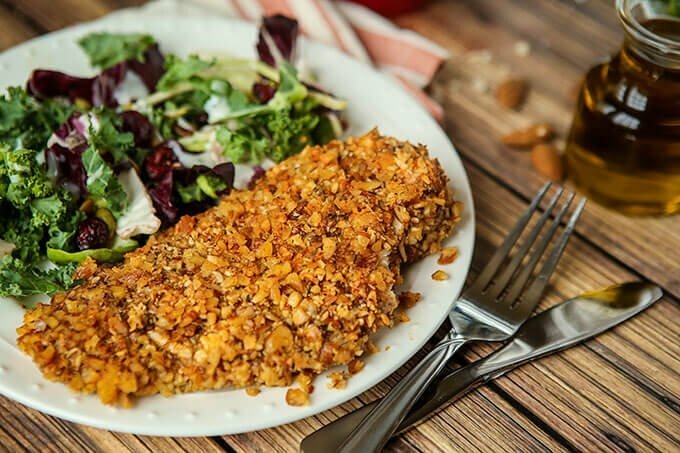 This paleo almond chicken recipe is easy to make and perfect for someone looking to try something new.The almond crusted chicken outside is crunchy while the inside is nice and tender! 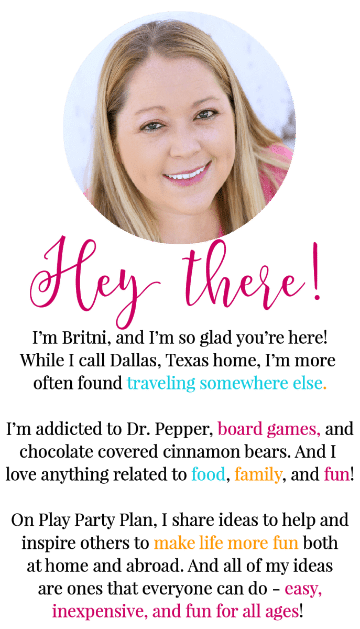 And it’s perfect for any diet – Whole 30, Keto, paleo, and more! I love chicken tenders, chicken wings, chicken nuggets, and pretty much any other chicken that’s been coated in something crunchy. This almond chicken gives you the best of all that without being fried or breaded. It’s encrusted in a crunchy almond + spice mixture then baked to perfection! If you’re looking for almond Chinese chicken, that’s something totally different. 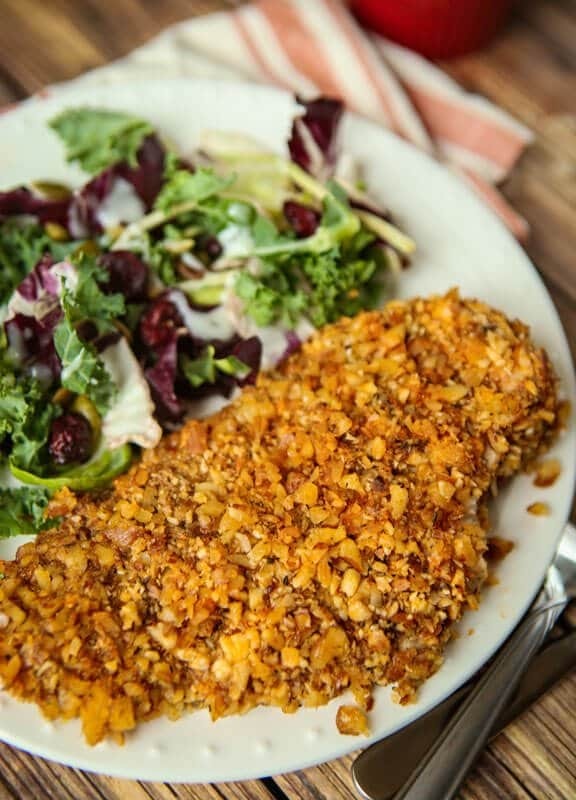 This is simply almond crusted chicken that’s perfect for a weeknight meal! I have yet to meet someone who tried this recipe and didn’t love it. It’s a family favorite too – even kids will love this take on chicken nuggets! There are three keys to making this almond chicken super crunchy and delicious! Don’t skip this step if you want it to really be the best almond chicken recipe ever. First, you want to crush the almonds and spices in a food processor until they’re small but not totally pulverized. You want small chunks of almonds, not ground almond powder. Using a food processor has always given me the most consistent sizing in the coating but if you had to, you could also just use a mallet and smash them up or something as well, but I recommend the food processor. Second, after the almond coating is on the chicken, pat it down with your hand. This will seal the coating to the chicken and keeps it from falling off. It also helps the flavors of the spices to soak into the chicken. Finally, add that drizzle of oil before baking the chicken. Again, it’s not going to make or break the chicken, but it will give an added layer of crispiness to the chicken and just help the coating brown perfectly. Want to see how easy it is to make this almond chicken? There’s a video below with step by step instructions. It really is as simple as it seems! Since you can’t just eat almond chicken by itself, here are some great sides that would pair well with this paleo almond chicken. You could always go with something basic like this strawberry spinach salad, cauliflower puree, or one of these other delicious sides! I’ve answered the questions I receive most frequently on this recipe below. If you have any others, leave me a comment, and I’ll do my best to answer as quickly as possible! Yes! 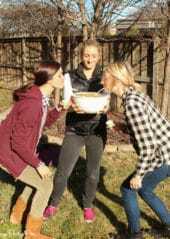 The recipe uses only clean ingredients – eggs, almonds, boneless skinless chicken, spices, and olive oil. It’s a great source of protein and fats and absolutely delicious! 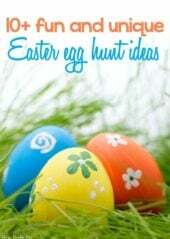 Make it even healthier by using organic chicken, eggs, and spices! How to Reheat Almond Chicken? My favorite way of reheating almond chicken is to simply put it back in the oven (350 degrees) for a few minutes until it’s warm and crisped up. You’re not cooking the chicken again so you don’t need to leave it in long enough to cook, just get warm. You can also microwave it in a microwave safe dish as well, but we try to limit our microwave use these days! Is Almond Chicken Gluten Free? This almond chicken recipe as written is gluten free. The breading is made up of chopped almonds and spices. If you want to add actual breading to the recipe you can, but you don’t miss it at all without it! How to make breaded almond chicken? If you want to do a full breading, add a 1/4 cup of bread crumbs to the mixture. You don’t even miss the breadcrumbs, and I’m normally all about the breading. The chopped almonds make a great crust all by themselves. How many calories in almond chicken? This is a hard question to answer because it totally depends on how much breading ends up on your individual piece of chicken and how big the piece of chicken is. Basic calories are in my recipe card below. How to make almond chicken sauce? We don’t normally eat a sauce with this almond chicken recipe, but you could make some sort of gravy or this cauliflower puree is great with it and acts like a kind of sauce! If you’re a big chicken lover like me, these other paleo chicken recipes should be added to your meal plan along with this almond chicken recipe! Don’t forget to pin this almond chicken recipe for later. I love how simple this is, but it looks so fancy!! Those are the best kind of recipes! My daughter made this for the family on a visit to my house. It is fabulous. So is my daughter. so glad you liked it, it’s one of our family favorites! You are absolutely right Amanda, I just missed taking that out when I adapted the recipe. Use a non-stick baking sheet or one lined with parchment paper. Its too hot for the oven to be used. Can it be cooked in an electric skillet instead? I’ve unfortunately never tried it in an electric skillet Marcy so I’m not sure! 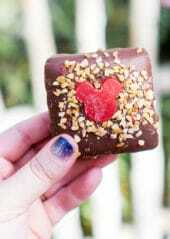 This was so easy and tasted yummy!! Even my two boys who don’t like anything new enjoyed it. I made this last night, absolutely delicious! Thanks for the recipe! My toddler ate I don’t even know how many helpings of this chicken while going “yummyumyum” the whole time. Definitely a good sign and we loved it too! Yay, I’m glad they loved it! It’s one of our favorites. Have you or anyone else tried this with boneless skinless chicken thighs? I haven’t tried it, but you should and let me know! I’m guessing you’d do the same thing – just need to cook the chicken a bit less since thighs tend to be not quite as thick as breasts. Let me know how it goes if you do that! Sooo adding this to our menu this week!!!! The almond crust is so delicious! Definitely keeping this on rotation . We had this for dinner last night and there were no leftovers! Will definitely be making this again and again! 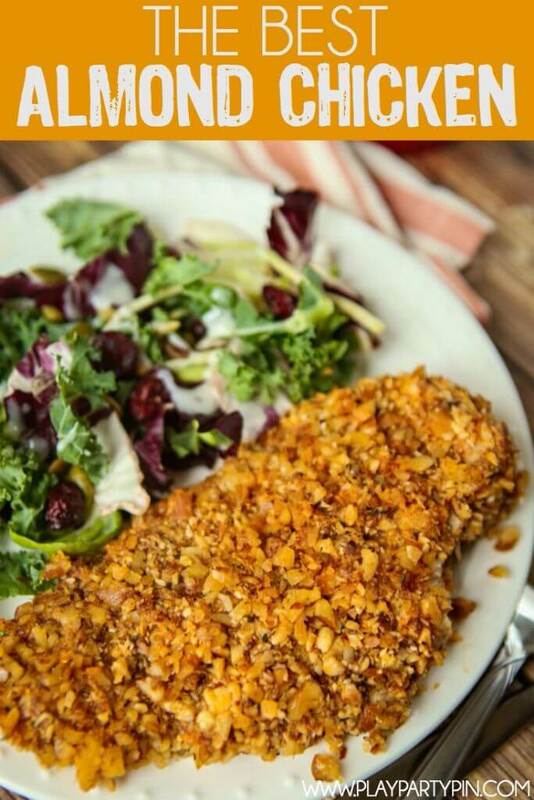 Crunchy breaded chicken, full of protein from the almonds? I’m totally sold! 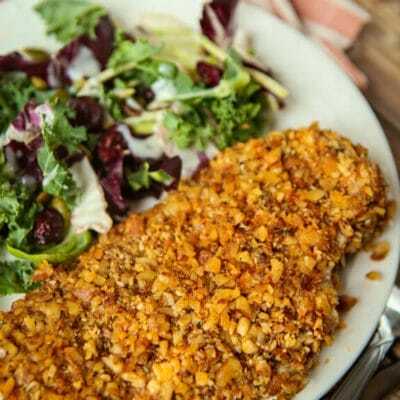 Have never heard of almond crusted cutlets.